With Restriction of Hazardous Substances now in full swing, there is growing demand for screening tools to check compliance. Hand-held, X-Ray Fluorescence (XRF) has emerged as the tool of choice for this task. XRF analyzer units are simple to use, easily portable and very effective. One example in this category is the recently updated, X-MET3000TXR+ by Oxford Instruments. The X-MET3000TXR+ looks very much like the competition. It is gun-like in form with a large body holding the X-Ray source, detector and electronics. The handle has a trigger with a Lithium ion battery pack in the base. The display is uniquely positioned on the back half of the body at an angle. This makes the display much more visible while the XRF analyzer is in use. This is particularly convenient for hand-held screening of large items. The entire unit weighs 1.8 kg (4 lbs). The new X-MET3000TXR+ replaces the original X-MET3000TXR, which has been in the market for over a year. Photo courtesy of Oxford Instruments. 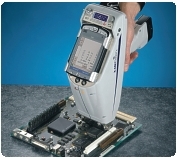 Like other hand-held XRF analyzers the X-MET3000TXR+ incorporates a PDA for data analysis and the user interface. At the time of this writing, the model in use is the HP iPAQ. One convenient operating mode is to show results for only elements of interest. Limiting the display to only Br, Cd, Cr, Hg and Pb turns the unit into a quick, RoHS screening instrument. Oxford’s XRF analyzer uses a patented, proprietary detector, the Penta-PIN (TM). According to Oxford, this detector is considerably faster than Si-PIN detectors used by other manufacturers. John Patterson of Oxford Instruments says “30 seconds is sufficient to determine the concentration of the RoHS elements within a light matrix like plastic.” Analysis of metal components requires longer scan times, typically in the range of 90 to 100 seconds. The X-MET3000TXR+ also has several operating features that make materials screening easier and more effective. In the RoHS evaluation mode, the software will return elemental measurements only when the measured level exceeds the concentration limit. As an added convenience, the Timed Assay function will start a screening with one click of the trigger and continue for a fixed amount of time. It is not necessary to hold in the XRF analyzer trigger for up to 2 minutes to get a reading. The Lithium ion battery pack will operate the unit for about 4 hours when fully charged. Recharge time is about 3 hours. Thus, with one extra battery pack and a charger, you can use the XRF analyzer continuously, stopping only to swap batteries at 4 hour intervals. Oxford Instruments has also taken care to define a clear and unambiguous screening process for RoHS. This flow chart shows the correct way to do RoHS screening with an XRF analyzer. The first check identifies non-compliant parts that are more than 30% above the RoHS limits. The next check identifies compliant parts that are more than 30% below the limits. This approach ensures high-confidence determinations of compliance and non-compliance. By clearly defining a grey zone in which the concentration levels are within 30% of the limits, Oxford steers you clear of mistakes. Any parts in the grey zone must be subjected to further analysis to determine the true concentration of the element of interest. Responding to customer concerns about radiation exposure in the workplace, Oxford has developed a shielded test chamber with interlock that attaches to the front of the XRF analyzer. When placed in a special stand, this turns the unit into a desktop XRF analyzer that can be used for continuous screening, day after day, with no worries about cumulative radiation exposure. I continue to see a strong need for XRF screening in compliance work. In the most recent compliance project I completed, validating the electronic components was quite easy. Most of the manufacturers had compliance certificates and material content data. The same was not true for the mechanical hardware. Sadly, hardware suppliers to the electronics industry are still behind the 8-ball. Most still do not even know what RoHS means. Fasteners and small, standard metal parts have become such commodities, that finding a material pedigree is next to impossible. Most hardware is purchased from distributors who buy it in bulk from the lowest cost manufacturer. The only constants are the mechanical specs. The material specs hardly enter into the picture. The only reasonable recourse is to use an XRF analyzer for screening on a regular basis. The X-MET3000TXR+ appears to be an excellent tool for this job. One final observation: the company has a very high opinion of the ruggedness and reliability of this tool. They offer a 2-year warranty on the XRF analyzer and a 5-year warranty on the X-Ray tube. That is much higher than the competition. The unit has also been certified by TUV. To me, this sounds like the old-fashioned way of designing products: make it solid, make it tough, make it work. Big Leaf LLC is a web publishing company. It was founded in 2004. 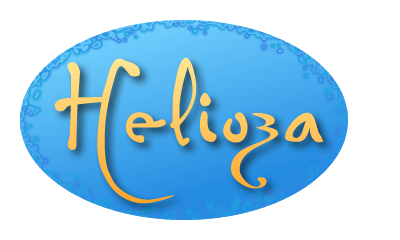 Helioza is our cornerstone site. We also created the AirportView.net site in partnership with AvSpec.